Kazue Kato is the creator of the smash-hit series “Blue Exorcist“, a series that has world renowned recognition. Time Killers is a collection of short stories done by this talented manga-ka, even featuring her very first work “Boku to Usagi (Me and the Rabbit)”. These stories show off her the stories and character designs that lead up to her finally creating the series she would become known for. Go ahead and hit the jump to see how this stacks up. My reviews are typically separated into two main sections labeled “Story & Plot Impressions” and “Character Development & Impressions”, but because Time Killers consists of many self-contained short stories, it will be difficult to provide a proper evaluation in my usual format and therefore, I will be doing something else. You will see sub-sections labeled by the name of that chapter, I will give my impressions of the story and characters together for it and move onto the next one (There are 11 in total, so there is quite a lot there to read!). If you want to see what I think in general while considering all chapters put together, that will be in my “Final Verdict” section at the very end of this manga review. Arigatou ありがとう! The main character, Shuri Todo, acts as an anti-hero with a broken past, but it seems like he distracts himself with work to fill a gap in his life, or maybe he has merely taken up the mantle that was left to him. This story is rather interesting in the fact that someone is following a beaten path, possibility because of what they have seen growing up and what they were forced to do; though it is unclear whether-or-not they are killing others based on achieving a greater good, or if they are doing it because they are now numb to the feelings it would bring about in a normal person. The problem I have with the characters in this story is that the tertiary protagonist has more real depth to his persona than the primary (mainly by giving him a concrete reason to be why he is, something solid to base his personality off of), even though you can clearly tell Kato really wanted him to have substance. The problem is that there is no real foundation to base Shuri’s way-of-life on currently and it is almost as though he is numb to killing altogether (Which is probably why someone said to him him “But you’re not a beast, you’re human! Don’t you have a heart?! I’m tired of looking at…. that lifeless face of yours!!“. I would have preferred more if they showed how Todo winded up doing his profession in the first place, even if it had only a brief flashback like they did when talking about his father. I feel like this story is lacking quite a bit in plot and characters, but that is also probably the reflection of it being one of the earliest (if not the earliest) work of Kazue Kato. While it might have been done in earnest, I did not particularly care for the characters, story, or plot advancement direction. Tomato is a cleverly named short story which feature two guys, a human named Sasuke Futamura and a rabbit named Usakichi Usa. These two unlikely body guards are set on a mission to protect a tomato field for one Mrs. Oka-No-An, an older rabbit woman who lives alone. This story is actually very enriching as it presents a clear objective, antagonists, protagonists, drama, and resolution all within the small confides of its 48 page one shot. It also tells a story about learning to accept those different than yourselves because there is worth in every living thing, as well as to not give up when you believe all is lost because you will never move on if you continue to stand still. The main character, based on his happy-go-lucky personality and the willingness to even spare his enemies, actually reminds me quite a bit of Naruto in demeanor. Even the little nuances of how the illustrator presents him (The way he smiles as he talks and his anger towards wrong-doing, also the uncanny ability to be able to befriend anyone) reminds you of Naruto, which is not really a bad thing. The rabbit, Usakichi, seems to be quite a bit older than Sasuke and has a lot of trust in him regardless of differing relations between rabbits and humans. That difference is shown through the antagonists relationship with the woman who hired them to protect her tomato fields, Mrs. Ota-No-An. I feel like the plot and the way it is executed is good enough to fit with the big boys of shonen manga (Bleach, Naruto, One Piece, etc.). I would honestly love to see this story expanded and made into something of a stand alone, though I would worry that it is copying Naruto from “Naruto” too much by their mannersims, as long as a different path is taken this would be an amazing manga to read. The plot of this is amazingly simple. Someone is born and raised to be a warrior, fighting without thought and taught that an honorable death would be one that is in combat. Seems he has spent his entire life fighting, leaving behind a path of bodies in his wake without thinking about exactly what he was doing. Finally, it seems his warrior life has caught up with him and he has experienced tragic loss for the first time in his life, though he was swiftly defeated within his moment of weakness and died in the same way that he lived. The character development in this is really streamlined and straight forward, we get to see someone live the same lifestyle as a boy and as a man. However, maybe the life style he lived was second nature to him until he seen what he did to other people and lost those he loved. In that single moment of vulnerability he lost, that showed his weaknesses and that he was still human despite his many victories in battle. This story was the shortest one yet, but it was also one that imbued the most raw emotion. Brilliantly done and really felt as though it was a story designed to be short when compared to the other previous works that seemed as though they were cut from a manga. This is pretty funny, not meant to be serious whatsoever. Seems a kid “Usaboy” (Rabbit boy?) is the child of two super heroes and he desperately wants to be a “Champion of Justice”. When he is left home alone, it seems he fights off a would be intruder, annihilating him and the experience drives home to him the conclusion that he is not ready yet. Though, the ending story shows a hilarious result as to whom he just defeated, we come to find out that the biggest antagonist was actually the boys imagination. The characters here all have rabbit-ear adorned gear, something that seems like a recurring theme inside of Kato’s manga (The same type of headgear was present in “The Rabbit and Me” short story). All characters appear to be very light-hearted and are made to be one-dimensional, but it works with the story and how it is presented. Following up to the comedy-themed short story “Usaboy!! !” is now this one titled “A Guide to Princess Clothes“. This happens to be another humor-filled short story, but it is only one page in length. The princess seems to think that getting dressed is a hassle, though she adores how her paper dolls are able to change dresses so easily…so she imitates them. It leads to an hilarious situation where the princess copies the paper dolls manner of dress which is akin to how hospital aprons work, covering the front but bare in the back. I actually really like how they designed the princess, she’s very cute and her dress is also good (the original, NOT the paper). She seems picky and obnoxiously snobby, but she also seems lazy and therefore a free-spirited thinker. I would say that the side of her that would grow tiresome and annoying as an oujo-sama would be balanced out by her hilarious dedication to trying to make complex or frustrating things easier (Since she lives a life of privilege and probably hates anything that takes a while to do). This story reminds me like the back story of Shuri Todo in the first short story of this manga called “The Rabbit and Me“. You basically have a man (Miya) who is doing shady deeds for money (Such as robbery) while having a child (Hikaru) with them, living on the run and just barely scraping by. However, I am unsure if they are actually related by blood because of the fact that one of Miya’s friends said to him, “You’re her dad, so you feed her! You two don’t look alike though” along with the fact that Hikaru said to Miya in a movie theater, “Someday I want to be pretty like her! Then you and I can be lovey-dovey like in a movie!”, which is not something a daughter would say to her father. However, unlike “The Rabbit and Me“, this has a happy ending instead of a gruesome one, which is good. I find hat this story is good because it features someone turning their life around for the sake of someone important to them, which is something that we can all relate to. The main two characters, Miya and Hikaru, are actually very likeable. Miya’s personality is one of a man who does not like conventional work, therefore he figures he would take what does not belong to him as long as no one is seriously hurt. The fact that he would do this anyone means he is not a likeable person initially, but his commitment to “Hikaru” shows a responsible side to his personality that is redeemable enough to make you forget about his bad qualities. Hikaru is one of the most kawaii things I have seen int his book so far, she seems very loveable and her faith in Miya is simply adorable. I say she acts more like a mascot for this series than anything else. I really liked this story because, while the plot was rather simple and straight forward, it was heart-warming and a tale of redemption. The character designs are the best in the entire manga thus far, and the dialogue is appealing. I can see this becoming a full-fledged manga if maybe they have Miya’s past come back to haunt him and Hikaru having to deal with the repercussions of his actions, either leaving her to go through life on her own or having to defend Hikaru in some way. Either way, I see this ending up similar to “The Rabbit and Me“, but with better characters and a plot that is a lot more fleshed out. This story is somewhat odd, a man who is drowning for someone unknown reason, is saved by a mysterious creature for further unknown reasons; the whole story just really starts off as a big mystery. This short has a good pacing which allows the reader’s interest to be grabbed from the very beginning, “Why is he drowning?“, “What is that thing? !“, “What exactly does doing that do?!“. From what I can tell, it looks like some creature that rarely shows itself before humans took upon itself the burden of helping someone whom it did not know. I find this to be rather amazing because we random see acts of kindness from strangers. The plot, because of the enigmatic qualities that surround it, has potential for expansion and development because of a need to explain what exactly is going on. Not much is actually said about the two characters featured here, but that is not something that actually brings harm to the story in anyway. You are more interested in what happened they are and what is going on than the characters themselves per se, they are left mysterious purposely by Kato. This is one of the very rare times where not having a lot of information on a character from the jump actually provides a rewarding experience. Something like this can go along the lines of becoming a great, epic manga, especially if at some point down the road the protagonist has to save or repay the creature who saved his life. This has quite a bit of potential in turning into a great series if it ever arrived at that, ominous story archetypes like this have a 50/50 chance of turning into masterpieces. A man who seems to be struggling by in his day-to-day life seems to be warming up his last prepared meal before new years day, but what happened next was sure to save his life. A bowl he had been eating out of for the past 15 years comes alive and names itself “Chawan”, wanting to repay the “Master” who has treated him with kindness for all this time, grants any wish that he may have. The man starts off with small things because of his disbelief, but he soon comes to take advantage of the power by eating lavish meals, dating beautiful women, and growing greedy with his money spending. During one desperate night as he is attacked, he orders Chawan to kill his attackers and Chawan breaks because of his constant use and things get worse one after the other. Eventually he wishes things to return to normal with the last piece of Chawan he still holds and seems content with what he has. They always say, “It’s always greener on the other side” but also “You don’t know what you’ve got ’til it’s gone“. The man’s greed got the best of him and eventually led his life so astray he wish it never happened in the first place, this is a story to wise up anyone who are taking advantage of a good thing and abuses it, too much of a good thing or horrible distribution of assets causes unwanted circumstances. The characters in this are not very memorable to be honest, but the story is good enough to where you are aware that they only act to fulfill the purpose of the plot. The character’s involved act as sufficient husks for the story to fill in, moving like marionettes controlled by the plot as a puppet master. This story acts as another lesson, just like “Master and I” does. A woman who was left with only a minuscule amount of things, no more relatives or friends, manages to scrape by day-to-day while living with the thought that she is all alone. Instead of standing complacent and reveling in her misery, she decides to move forward in order to search for “something”, even if she did not know what that something was. Eventually she is swallowed up completely by her despair and is overcome by the emotions she feels as she hits a barrier that feels like everything has ended, only to awake renewed and refreshed by the vision of what lies before her. She lives the rest of her life happily and dies. This story is more-or-less the same lesson that Oka-No-An experiences in a previous short in this manga entitled “Tomato” as both are the remaining survivors of their people (Though, how exactly the people died in “A Maiden’s Prayer” is a mystery). Like the previous shot “Master and I”, the characters is more-or-less not very memorable because they only exist to fulfill a specific purpose for the story’s ideology. This character could be ANYONE, they just happened to choose a woman as the protagonists but really, the moral of this story is genderless and non-character specific, there is not really more to say to it than that. A boy who is bullied for his love of astronomy is doing what most high school students do when they are unpopular and ostracized by their pupils, they want to change and be more like what the other kids find to be “cool”. He tries to discard his personality in order to change how people perceive him, only for it to betray him in the end as “Tezuka”, a girl whom he likes, happens to fall under the same category as he does by being an “Astronerd”. As aliens come and threaten to destroy his planet (the characters drawn reminds me of the anime “Sgt. Frog“), he begins to realize how futile his efforts are and risks his life to tell Tezuka the truth of his personality and manages to save his world in the process. This story continues the lines of lessons that “Master and I” and “A Maiden’s Prayer” have given us already. The moral that his story tells is to “Never be afraid to be yourself”, because you will ALWAYS be you no matter what you attempt to do. Trying to change for shallow reasons, such as impressing others, will always end in a negative result, so it is better to wait for people who appreciate you for being yourself because the rewards are infinitely greater with nearly nonexistent hassle. The characters in here are very relatable to me, possibly because I can relate to the story as a whole. The main character (They do not his name), has obviously been bullied and teased for something he lives that is not found to be “conventional” by other students. 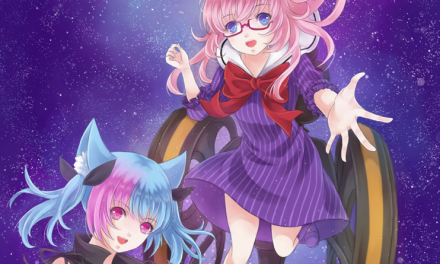 It also does not help that there is an obvious double-standard in place within the confides of the manga that judges female “astronerds” as cute while making the boys appear to be creepy and unappealing. Tezuka acts as the secondary character and reminds me heavily of a friend of mine named Bianca, despite her appearance she is into things that most people would consider to be “nerdy” or “geeky”. This character makes our protagonist realize that he need not be ashamed of who he is and that attempting to be untrue to himself will simply make matter worse before they are better; Tezuka provides a supportive role in allowing the main character to be who he wants and feel proud in doing so. This is a supremely done one-shot, telling a big story about self-reflection while showing the consequences and benefits of “Staying true to one’s self”. The characters were easily relatable and something I have even found in real life, while the “alien” thing was a bit random, it was there to add added drama in a manga-like way to a more serious story about our views on ourselves due to personal preference versus succumbing to peer pressure. This was excellently done, I loved it. An innocent girl who’s life has been preyed upon by a demonic overlord is freed by someone whom she befriended a long time ago. This story has one of the elements that we have seen in “The Rabbit and Me” where someone goes out of their way to help when they do not have to, the only difference is that helping hand has simultaneously thrown Monaka’s world into chaos as well as allowed it to be saved by Noctis. Noctis is a low-level demon whom was shown kindness by Monaka where he otherwise had knew only pain, this changed his perspective on lie and gave him new happiness. As demons took notice of Monaka and had him on the brink of death, he made it his life’s goal to kill demons who prey upon humans as well as to save Monaka. This story shows both the positives and negatives of helping out someone, that “No good deed goes unpunished” and that your efforts to be good can have a negative impact on your welfare, but that sometimes that very same kindness can be your saving grace. I feel this is a very dark story with a decent ending, yet is still melancholy and leaves a bitter taste in your mouth, but in a good way. This shows how harsh reality can be, but also that sometimes things will correct themselves. The characters are actually phenomenal, I really like the designs for both Noctis and Monaka. Monaka is shown rather stoic and emotionless at the beginning of the manga, a product of her parents untimely death while carrying the burden of believing to be responsible for it (This can be a bit annoying, but once you get further into the story it makes perfect sense). Also, the years of being harassed by the demon who has possessed her uncle has not proved to lessen her pain any. Noctis is showed as weak, powerless, and living a life of painful mediocrity. However, it shows that someone’s world can be changed in the blink-of-an-eye as long as they are treated with value by someone with a kind heart. Noctis also proves to be a character who was willing to stand up against forces beyond his power in order to save someone, even though he had not thought he himself was worth that much effort. I feel like the enemies seen were lackluster at best, but the gist of the story is good enough to prove this one lacking factor completely irrelevant. I enjoyed this one tremendously and it should also be noted as the cleanest and most professional looking work in Time Killers and makes sense as to why they saved it for last. This work has the story depth of the “Astronerd” short with the striking art designs of “Highway of Life, Stray Star” one shot. Those who read this will not be disappointed. There are a couple of things I want to note about Time Killers that does not necessarily fit into the sections with the short-story analysis. First off, I want to talk about how the art tends to progress with each single story. Things seem a bit rough starting with “The Rabbit and Me“, but by the time we got to “The Miyama-Uguisu Mansion Incident” it is easy to tell that Kato’s style is now close to being perfected. Instead of opting to draw triangular noses with shadows as many anime artists do, Kazue seems to often op for more realistic looking nostrils and a wider face with either squared or rounded chins, these are what make up the unique look that we are seeing. The next is Kazue Kato’s obsession with rabbits. Rabbits in some form have appeared throughout most of these short stories in this book, be it rabbit people, rabbit helmets, or rabbit super heroes. It is obvious that the manga-ka is a big fan of usagi, even making themselves out to be one at the end of the book which has author’s notes about each of their stories….which brings me to my next topic of discussion. At the very end of the manga, we are given a short section titled “Something Sort of Like an Author’s Note”. Here Kazue Kato draws a hilarious little comic giving out random information about each one of the short stories in the book, such as how Tomato was in Akamaru Jump when she was about 20 -years-old and how she did Miyama-Uguisu Mansion Incident at 28-years-old for the main SQ Mag and is considered to be her prototype for her massively popular “Blue Exorcist” series. This was an excellent idea to throw into the back of the manga to tell what was going through the author’s mind during each of the shorts she has created and when she brought them to reality. STRENGTHS – Stories vary in variety and seriousness, Artwork is impressive and gets progressively better, Some one shots are simply superb because of the moral of the story it tells, Author’s notes at the end of the book gives additional information on each story which enhances the overall experience. WEAKNESSES – Some of the manga are merely “so-so”, Overuse of rabbit influences can prove to be a bit annoying, No continuation of any story because they are all one shot shorts, Some of the stories tell an amazing life lesson yet have no memorable characters. 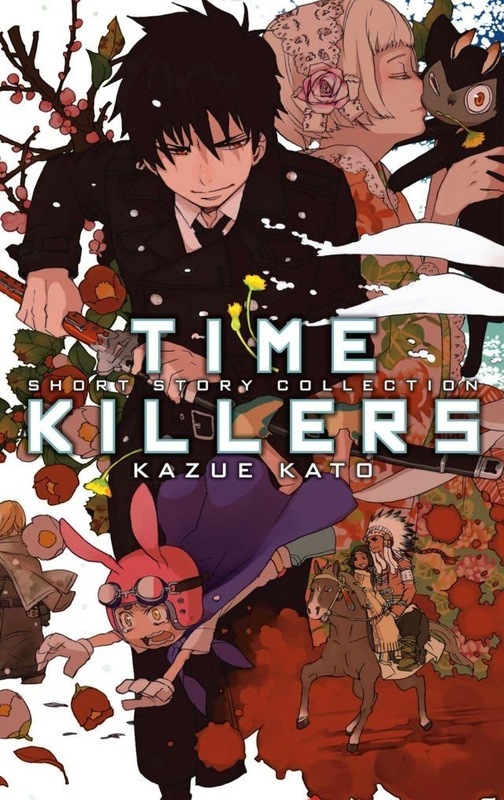 Time Killers is an interesting idea for a manga book, combining one shots and stories as sort of a chronological diary of what lead up to Kazue Kato’s breakthrough hit Blue Exorcist. They varied in their content, from the stern and serious to the light-hearted and comedic, I liked their mixed palette of material. At the very same time, this is something that also works against it because there is no concrete single story to evaluate, and this book was doomed to a “Half-and-Half” rating simply because of the mixed bag of stories, and not all of them are good. I really liked stories like “Tomato“, “Astronerd“, and “Highway of Life, Stray Star“, yet I was not much of a fan of “The Rabbit and Me“, “Usaboy!! !“, and “A Guide to Princess Clothes“. There are just as many good things about it as bad, and it could easily be perceived differently by different people with so many stories to pick from. Overall, I enjoyed this book and would recommend it to anyone, mainly because there are no additional volumes to buy after this and we get complete little stories complete with notes by Kazue Kato herself. I feel this is a must have for anyone that are fans of the Blue Exorcist creator and enjoys massively thought out one shots that each have a different flavor to them. Thank you for reading my review for Time Killers! I hope it helped you!